To purchase tickets for Museum Admission on February 23, click on Buy Tickets below. In this multimedia presentation, learn about Disney animator Ward Kimball — the only employee Walt Disney called a “genius” — and his incredible railroad hobby. Kimball supervised the creation of iconic Disney characters including Jiminy Cricket in Pinocchio, the crows in Dumbo, the mice and Lucifer in Cinderella, and the Cheshire Cat, Mad Hatter, and March Hare in Alice in Wonderland. 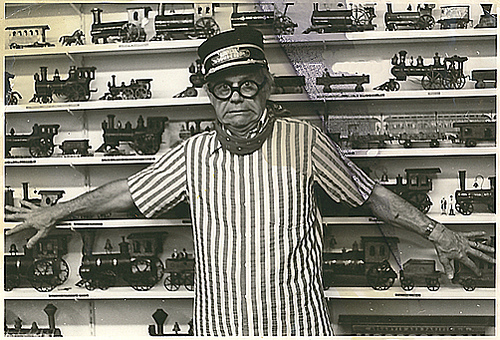 You’ll see rare video and still images of Ward’s remarkable train collection as we explore how railroading influenced him and vice versa. We’ll highlight the incredible Grizzly Flats Railroad that Ward and Betty Kimball built in the 1930’s and discover how it is being preserved for future generations today. Finally, we’ll reveal how Kimball was directly responsible for rekindling Walt Disney’s love of railroading, and how this led to Disneyland and the modern theme park experience. Presented by Michael Campbell, a Disney historian, public speaker and curator of our current exhibition, Walt Disney’s Trains, with special guest Ken Mitchroney, a director, animator, best selling author and leader of the Emma Nevada and Chloe locomotive restorations projects.